New research at The University of Adelaide Waite campus has found that a plant survival mechanism observed in wheat and barley flowers may be exploited to promote cross-pollination. Wheat is a self-pollinating crop that produces seed when pollen from anthers fertilises the receptive ovary in the same flower of a single parent plant. Hybrid wheat, where seed is produced from two different parent plants, requires cross-pollination which is rare in nature (normally <1%). Commercially produced hybrid wheat is desirable to boost yield and develop varieties that are better suited to specific conditions like drought, heat, poor or saline soils, and show resistance to diseases. Hybrid varieties of other cereal crops such as corn and rice produce higher yields and exhibit resilience under these stress conditions. One way to prevent self-pollination in wheat is the use of male-sterile lines that do not produce pollen. These plants can then be cross-pollinated by male-donor lines. For cross-pollination to occur, wheat florets of the female line must be open to allow pollen from the male donor line to reach the ovary. Normally, wheat flowers only open for less than 30 minutes then close (known as the ‘first opening’), as the self-fertilisation process occurs within the same flower. The research, published in the Journal of Experimental Botany, found that the unfertilised ovary in the florets of male-sterile wheat plants swells and pushes apart the floret, resulting in a ‘second opening’ of the flower. This can last for several days, providing a much longer opportunity for cross-pollination to occur. This swelling of the unfertilised ovary may represent a survival mechanism in self-pollinating cereals such as wheat and barley, ensuring seed set in the absence of self-fertilisation and increasing genetic diversity through cross-pollination. Lead author Dr Takashi Okada, School of Agriculture Food and Wine, said that improving cross-pollination efficiency is a key factor in reducing the cost of hybrid seed production. The same research group at Waite recently discovered a wheat gene that, when turned off, eliminates self-pollination and thereby facilitates cross-pollination. Together, these research findings provide useful new knowledge to aid cross-pollination in hybrid wheat breeding. 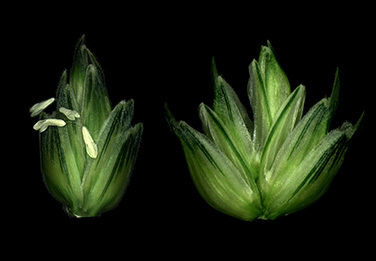 Image left: Images of wheat flower opening caused by swelling of unfertilized ovary. Left panel represents closed flower of fertile plant with developing grain encased. Right panel illustrates flower opening in male sterile plant by radial expansion of unfertilized ovary, separating palea and lemma. This entry was posted in News, School of Agriculture, Food & Wine, Waite Research Institute. Bookmark the permalink.